The demographics of the workforce are changing in Missouri and across the United States. Understanding the forces that drive workforce dynamics and population migration is important for community economic planning and development. Since the early 2010s, the share of Millennials (born 1981 – 1997) and Generation Xers (born 1965 – 1980) in the workforce has more than doubled in comparison to the share of Baby Boomers (born 1946 – 1964) and their predecessors. And in 2015, Millennials surpassed both Boomers and Generation Xers as the largest demographic in the workforce. As the share of Boomers in the workforce continues to decline in the next decade, it will be important to understand the factors influencing where the following generations choose to live and work. Across the United States, Millennials from rural backgrounds are increasingly choosing to leave their family homes in favor of urban environments. 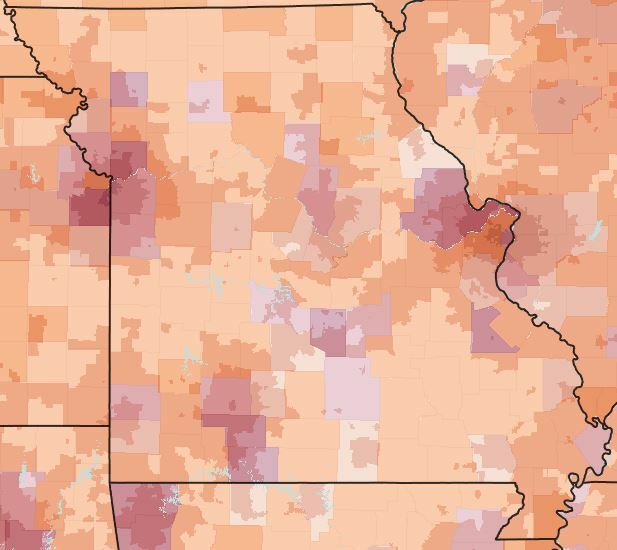 These trends largely drive population change in Missouri, particularly in areas of “rapid growth and decline”. This shift has implications for economic development – the availability and technical level of the local workforce is commonly the most important factor considered in site-selection decisions. Young Adult Net Migration Rate, 2000-2010 (U. of Wisc.) and Employment Accessibility (EPA 2011). Projections from the Missouri Office of Administration are consistent with the current trend. By 2030, the 9 of the 10 counties expected to experience the largest population declines are rural. Top-Ten Largest Projected Numeric Decreases in Missouri Counties, 2000 through 2030. Missouri Office of Administration. The United States saw a net gain of over 5.5 young adults aged 20 to 29 between 2000 and 2010. Some of this increase is attributable to a large number of Millennials entering this age cohort at a faster rate than Generation Xers are leaving it. However, immigration from outside the US also drives this growth – over the past 5 years, Pew Research Center studies found that “over half of newly arrived immigrant workers have been Millennials”. Between 2000 and 2010, the United States saw a net increase of over 8.8 million immigrants. Missouri’s share of that increase was less than 1.0%, and the state ranks 40th for immigrant share and 26th for total immigrant population. For more information on migration patterns and projections in Missouri, please see the Missouri Office of Administration: Population Trends report and view the charts below. 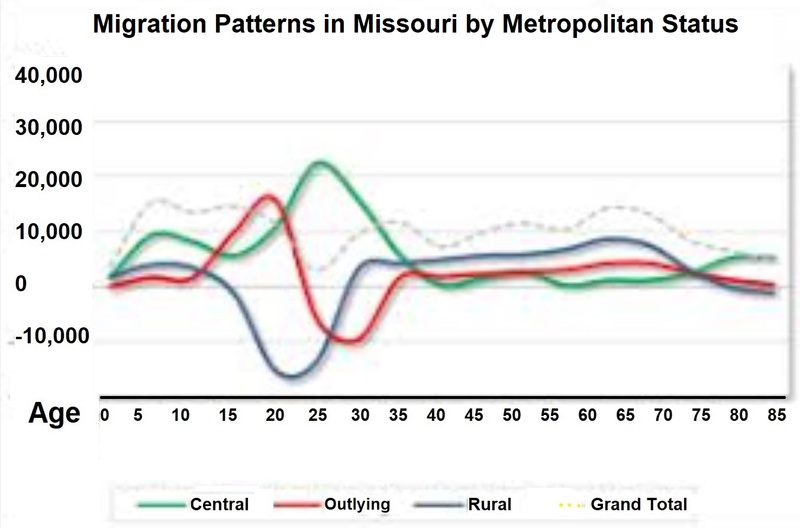 Missouri Migration Trends 2000 to 2010 by Metropolitan Status. University of Wisconsin Applied Population Laboratory. 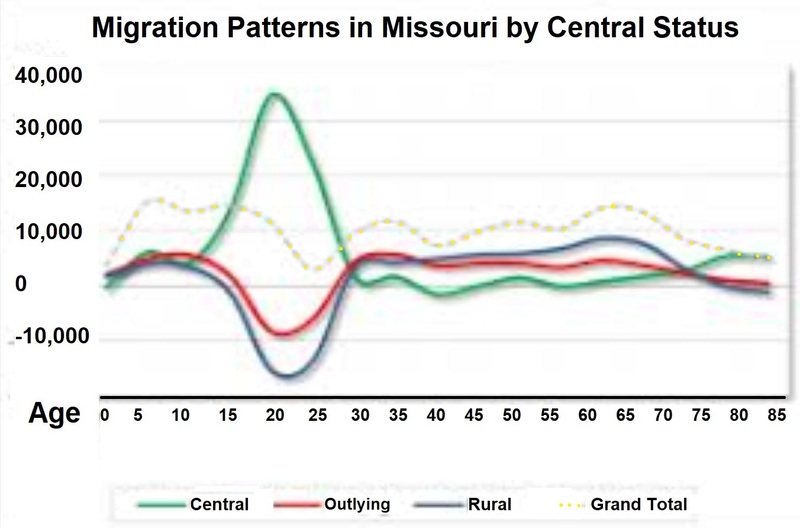 Missouri Migration Trends 2000 to 2010 by Central Status. University of Wisconsin Applied Population Laboratory.